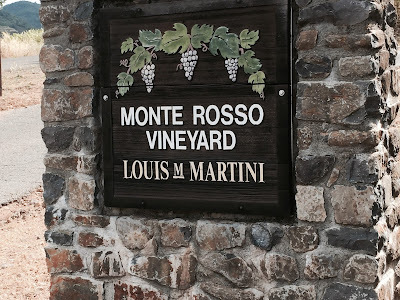 I recently was able to tour the historic Monte Rosso Vineyard of Louis M. Martini winery with my good friend Joe Becerra of winecountrygetaways.com. During this visit we learned so many facts about this historic place in the hills of the Mayacamas mountain range. This vineyard has been the source of a major portion of older vintages of Martini Special Select and Private Reserve from the early 40's to well into the 80's and still is part of their Napa bottling. The vineyard is a total of about 500 acres of which 250 are planted with grapes. The vineyard was founded and built by Emmanuel Goldstein in the early 1860's. He was a well to do grocer who turned his interest to wine and with the labor of early Chinese immigrants the land was cleared and the vineyards were established. In 1886 he built a stone gravity fed winery on the property. This facility has been deemed unsafe since the earthquake of 2014. There are no plans at present to reinforce the building. The keystone with the founding date is visible from the road. The vineyard changed hands a few times and continued to produce fruit through prohibition. At he end of prohibition Louis M. Martini bought the vineyard named Mt. Pisca and named it Monte Rosso due to the deep red volcanic soils. These came about as a result of the volcanic eruption of Mr. Veeder thousands of years ago. E.J. 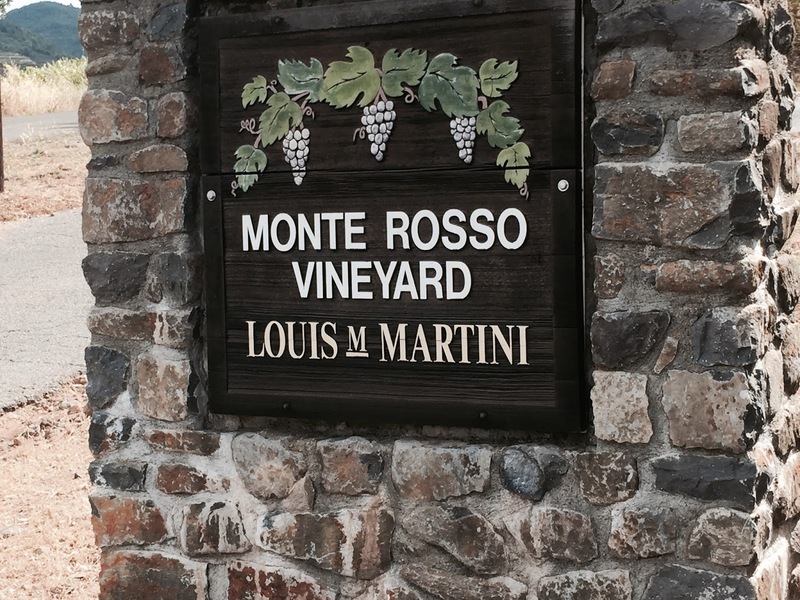 Gallo purchased the Louis Martini winery in 2002 and with it Monte Rosso. Today they continue the Martini tradition of excellence in the vineyard. We were able to get up and close to the area with information provided to us by Ranch Manager Brenae Royal. She is responsible for information about all facits of the growing cycle. When asked what was a problem with vineyard health her response was mites. Because it can be so dry and dusty there are a large number of them. They are using natural predators but it is an uphill battle. I was amazed at the vigor of the old vine Semillion !! The major reason the vineyard is so unique is that it is the home to more than 40 acres of vines which are from the 1890's as well as more than 75 acres of 75 year old Cabernet Sauvignon which were planted by Martini in 1938. The following red grapes are grown: Cabernet, Petite Sirah, Syrah, Malbec, Petite Verdot, Cabernet Franc and Sangiovese. The older rootstock is St. George and that stood Philox?). What is also unusual is that there are two blocks of white grapes on the property. There is a 3+ acre parcel of 110 year old Semillion and another block of Folle Blanche that dates to the late 1930's. All the red wines carry the signature rich full mouth flavors of red fruit and solid acidity and tannins. Once you taste a Monte Rosso wine you begin to understand that the flavors produced here are unique to this site only. There are a number of wineries who produce Zinfandel or Cabernet from this vineyard. Martini produces Monte Rosso fruit that is made at their mini winery, Winery 254 located at the back of the main wine making facility. Ed Sbragia gets his Cabernet partly because he and Mike Martini are old time musicians who play together and they have know each other for decades. Mike Carlisle and Morgan T. Peterson get their grapes as part of their mission to produce wines from heritage sites in California. Others are: Rockwall, Rosenblum, Rancho Zabaco, Biale and Ravenswood. They all produce classic renditions of this site. The average cost of a bottle of Monte Rosso is in the area of $40/60 a bottle. The cost of fruit is quite high and you can understand when the quality of the wine is so high. Morgan Twain Peterson has the best explanation of Monte Rosso and the wines produced. All varietals grown provide the aromas and flavors of the vineyard. Cabernet, Zinfandel, Syrah you name it they all have the imprint of the vineyard. You smell and taste Monte Rosso before you get the the varietal character. This is what makes Monte Rosso so distinct and unique. You must try some soon. How do you get top dollar for your wine? You have some wines that need to find a new home or you have come into possession of wine you choose not to drink, what are your choices to turn these bottles into cash? After selling some wines through different channels I have found that all ways of selling wine are not equal. Remember that selling something involves your fixing a price and getting the price you want. You then have to transfer the wine and get payment. Winesearcher.com is an excellent source for finding the current price of your wine at the retail level. If you sell a wine at retail that means you gain full mark up. Make sure your price is such that the buyer feels they are getting either a good deal or a wine which is hard to get. All auctions need to make money from their sales and the work they perform in not only sales but advertising, delivery and payment. K&L Wines have an auction department that will take your wine and take a photo of it and give an impartial description based on prior evaluations from printed sources: Parker, Decanter, Wine Spectator and other published descriptions. They offer the seller a few options. You can take the sale price of the wine minus 15% as the final money earned from the sale. So $1,000 would net you $850. You can also choose to take the final payment as a credit at the store. So now you have $1,000 to spend but your cost of doing business is reduced by the profit margin of the wine (10-15%) and the taxes on the purchase (9%). K&L does not charge the buyer a premium for the wine. Bonhams run auctions every three or four months. They will take your wines and put them in a catalogue at an estimated price of high and low for the lot. If you have a large amount of wine you may also have to give up a bottle for tasting purposes which you must include in your sale price. They also take a percentage of the sellers price for their part of advertising and promotion. Bonhams also charges the buyer of the wines 19% above the final hammer price plus sales taxes. This turns out to cost you almost 30% on top of the purchase price. I have sold wines in parts of Southern California which pay much more than in Northern California. Prices for older wines vary and from my experience there is more money to be made in Southern California with both older and smaller hard to find wineries. Once again wine searcher is valuable in finding sources for wines. Ebay and other on line sources are a way to sell but you become involved in transfer and monitary exchange. I have not done this but have friends who have sold wines to restaurants and retail stores. These sectors need to make a profit and often do not offer higher dollar amounts for older and rare wines. There are retailers of wine who will buy wines in high demand but they need to make a profit. They are also cautious about how the wine was handled and how it was obtained. I know of people who have taken dinners in exchange for wine at restaurants. This works for both parties if both agree. Establish a price that you will sell your wine for. Research and find a source that will accept your wine and give you documentation as to the minimum you will accept and a time table as to when the wine will appear for sale. If selling at retail make sure the buyer is solvent and of solid reputation. Be prepared to be told that your wines are not worth as much as you feel they are worth. In the end it your choice to make as to what you will accept as your final payment. Good luck…. Recently I was able to visit Louis M. Martini winery and see their small scale winery built within the larger Napa facility. Cellar 254 is the place where all Monte Rosso and Lot 1 Cabernet are made. Tasting the array of wines made by one of the original Napa wineries was a special treat. We were able to talk with Kori Butler the head winemaker at Cellar 254. She told us the name 254 is actually the address of the winery along Highway 29. I will give you my impressions of the wines tasted and and hopefully help you find and enjoy the classic reds produced by this state of the art producer. Mike Martini is the head winemaker and last current member of the family to be fully involved in daily production and decision making issues. He has a long history of participation and innovation at Martini as well as in Napa. The winery has been owned by Gallo since 2002. Since there were no family members who wanted to continue in the business Gallo offered to continue the style and reputation and maintain the family name in wine. The real story here is the Monte Rosso vineyard on the Sonoma side of the Mayacamas mountains. This vineyard of almost 250 acres has significant parcels of Zinfandel and Semillon which are over 100 years in age. Much of the fruit is sold to other wineries such as Baile, Rosenblum, Spragia, Bedrock, Ravenswood as well as from time to time Cameron Hughes. What separates Monte Rosso from other vineyards is the iron red soils and proximity it has which is frost free with warm days and cool nights. Taste is the ultimate signature of a vineyard and Monte Rosso has it in spades. Deep rich and ripe fruit that has aromatics of earth, berries, stone and solid acidity and tannins. Planted in the 1880's there is still the shell of the original winery on the site. In my opinion no other vineyard has this unique quality produced year in and year out. 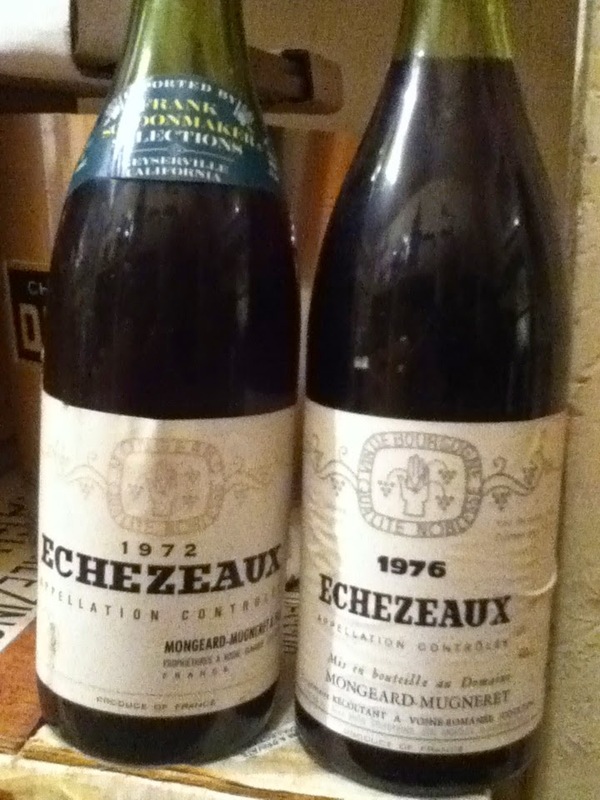 Priced between $30-$85 these are reds to savor and sip with others who want an experience that is unique and profound. 2011 ALEXANDER VALLEY CABERNET--- this is a stunning bottle of wine. I found a huge nose of wild berries and a distinctive cedar/pine aroma that was worth the price of the experience. This was a huge eye opener for me and I brought home some bottles for future consumption. OUTSTANDING. 2011 LOT 1 CABERNET-- made from select parcels of Cabernet grown in the Napa appellation. Two to four ton lots are fermented separately then blended for the optimum expression of the vintage. This is their flagship wine to rival wines like Mondavi Reserve, B.V. Private Reserve or other top flight wineries. Excellent quality. 2011 MONTE ROSSO BLEND--- a mix of Cabernet, Zin, Petite Syrah, Malbec and Cabernet Franc. This bottling shows the intense flavors and sense of place that is Monte Rosso. Alcohol in the 15% area with huge fruit that flows over the palate and fills your mouth with rich flavors and persistent mineral tones. This wine shows what sense of place there is from this classic vineyard. 2010 MALBEC---- tastes like Monte Rosso red wine period. Does not show the aromas and flavors of the typical Argentine wines sold at $20 price point. This shows the fact that it is more the vineyard than the varietal that drives the fruit and aromas of each wine. Very good especially with typical meats and cheeses that absorb and compliment red wine. Really fine for the expression of the vineyard. If you are interested in tasting California history look for and experience any Monte Rosso wine. Better yet compare a few wines made by other producers and decide for yourself. So many wines sold as Old Vine are about 25 years old which is when production begins to decline. Monte Rosso is true old vine fruit that does not have to be pruned as it regulates itself and provides intense fruit on a limited basis. As the old saying goes "some things do get better with age"
Thanks to the staff at Gallo for their help in putting this event together.